Judd Gregg, financial services chief, addresses Club Luncheon Nov. 7. 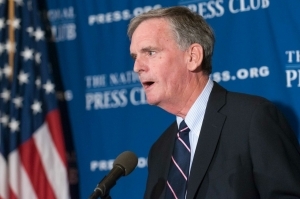 Judd Gregg, chief executive of the Securities Industry and Financial Markets Association (SIFMA) told a Nov. 7 National Press Club Luncheon that  brokers – who comprise a large portion of SIFMA’s membership – should put their customers first. Under current law, brokers do not have to act in the best interests of their clients. They can recommend products from their own company that have higher fees than a competitor’s offerings. Brokers differ from investment advisers in that advisers must act in the best interest of their clients. SIFMA has introduced a program to educate individual investors about what the group calls their “rights” when dealing with financial advisers, including receiving “personalized investment advice about securities that is in your best interest,” according to a brochure outlining the SIFMA initiative. The document also says that investors should be informed of brokers’ conflicts of interest and be “clearly informed” about investment-account fees. “We intend to essentially reconnect with the American people by reinforcing the fact that the financial markets’ basic purpose is to help Americans succeed and to allow Main Street to prosper,” Gregg said. The trade group will take its message beyond Washington into Rotary Clubs, Boys and Girls Clubs and other local venues.“We will basically – one-on-one – talk about the importance of the financial industry in the day-to-day lives of people and the how we work with them to try to help them succeed,” said Gregg, a former New Hampshire Republican senator. Gregg said that the key to a vibrant economy is combining individual entrepreneurial initiative with available capital and reasonably-priced credit. He noted that over the last five years, businesses have raised about $6.3 trillion in capital in financial markets, which has contributed to job creation for all Americans. He also noted that bonds have financed eight million miles of roads, 1.5 million bridges and 500,000 miles of water pipes. In order to fulfill that role, Gregg argued that Washington regulators need to ease up. He said that the Dodd-Frank financial reform law has gone overboard with its prescriptions for the market.